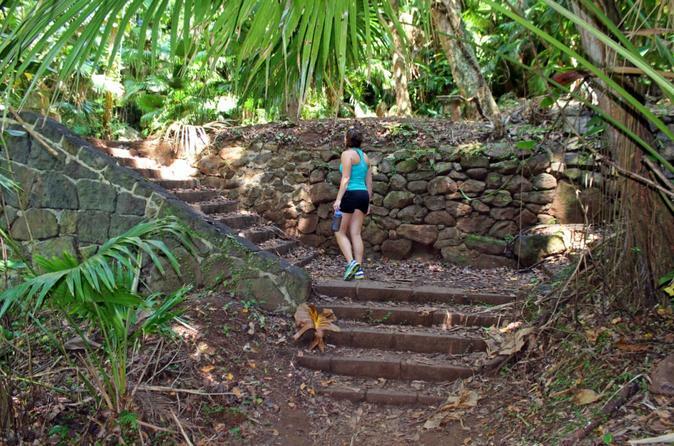 This tour focuses on some of the ancient/cultural sites found on the island O'ahu. Learn about and discover ancient Hawaii as you visit Heiau's, fishponds, ancient battle sites and more. This tour is a good combination of regular tourist stops as well as "off the beaten path" locations. Our guides are knowledgeable and friendly and will provide a laid back and relaxed atmosphere, so that you and your ohana can enjoy your day to the fullest. Join us and discover ancient O'ahu. Pickup location is at your hotel. We will circle the island in a 4 door Jeep Wrangler or a Ford Transit Connect 7 passenger van (depends on the size of your party). We will stop at numerous scenic lookouts, ancient site, cultural sites and much more as we circle the island. Your guide will be with you each step of the way and will be there to answer questions and share his/her knowledge with you. There are several options for good local food from which you can choose for your no-host lunch. After lunch we will make a couple more stops and then get you back to your hotel so you can hang out on the beach for the rest of the afternoon.